Suitable for ceramic or natural tiled flooring, or even Vinyl with a suitable levelling compound, our range of Warmup loose wire systems can be fixed straight to the sub floor in a matter of hours – there is no need to raise floor levels or dig it up. The heating cable is the toughest and thinnest on the market – only 1.8mm, and the system provides the best flexibility of layout so they’re ideal for awkward shaped or smaller floor areas. We stock a number of pack sizes. 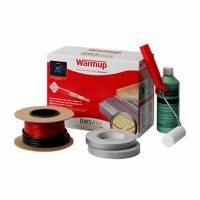 We are proud to sell a wide range of Warmup products at Atlas Ceramics, including the Warmup Loose Wire System. Warmup is one of the world’s leading underfloor heating manufacturers, and its loose wire system is the perfect option if you want to install a high-quality and durable heating system in a room with an irregular shape. Here is some information about the Warmup Loose Wire System to help you decide whether it is the right option for your home. What Is a Loose Wire System? A loose wire system is one of the main options you have when you decide to install an electric underfloor heating system, with the other option being heating mats. Warmup provides both of these products, and we sell them both in our store. Whereas heating mats are designed to be rolled out onto the floor in rooms with a regular shape, loose wire systems are the best option for irregularly shaped rooms like bathrooms and kitchens that have various obstacles in the way like cupboards and sinks. In this case, rolling the mat out would be impractical, so loose wire systems are used instead. They consist of a flexible wire that can be positioned in the room to go around obstacles, making them much more flexible to install. The Warmup Loose Wire System can be used with ceramic or tiled flooring as well as with Vinyl flooring if you use a levelling compound. Why Choose a Warmup Loose Wire System? The system comes with the thinnest heating cable available at just 1.8mm thick. Despite being so thin, it is still incredibly tough. It has a very small cross-section, so it can be installed without a self-levelling compound layer. The wire can be fixed directly onto the subfloor and there is no need to dig up the floor or raise the floor levels. The entire system can be installed in a matter of hours. It’s a very flexible system so it is perfect for rooms with awkward shapes as well as small rooms. It can be used for either primary or secondary heating. You can use the system with various floor types including natural stone, ceramic, tiles or even wood. Measure the area of the floor area in the room to determine how many packs you will need. Clean the floor so it is free of dust, then apply the tile adhesive onto the floor and place the insulation boards down if you are using these. Apply the primer if needed (if the surface is porous or dusty) to improve adhesion. Mark the floor using the sizing guide in your manual. The wire should not go closer than 40mm from the wall at any point. Test the system with a digital multimeter to make sure it is working properly. Lay out the wire by pulling it gently from the box and placing it inside the area you have marked out. Secure the wire at the ends of the room with tape. Make sure the wire does not go under fixed fittings or furniture, and never cut the wire. Install the thermostat and the floor probe, which measures the temperature of the floor. Ensure you hire a qualified electrician to complete any electrical work. We sell the Warmup Loose Wire System in a variety of sizes. There is just one system, but the packs range from 1.5-2.4 square metres to 16-17.4 square metres. The pack you choose depends on how large the floor area is in your room. Each kit comes with the heating wire, a roller, tape and primer. We are currently offering 35% off all Warmup products in our store! Simply choose your underfloor heating products and you will instantly get a 35% discount on your purchase. But hurry, this offer won’t last for long! You will also need a thermostat to control your loose wire system. We sell a wide range of Warmup thermostats, from basic manual models to smart Wi-Fi models. Ideal for undertile or other floors. Our great offers will soon have your home feeling ambient once this ultra neat, thin, ideal, undertile system has been placed around your current design or hard to reach areas. We also recommend that you use insulation boards. These prevent heat being lost downwards into the ground, improving the efficiency of your heating system and helping to save energy and save money on your bills. If you would like to install underfloor heating in an irregularly shaped room, the Warmup Loose Wire System could be the perfect option. Simply choose the size of your system from our available products and purchase it directly from our store. And if you have any questions about this product or any other products in our store, please contact us and we will be happy to assist you.